On this blog, in several posts, I have written about the neo-religion of psychology as ruining people's awareness of sin. This idea is not new, and some prominent people in the 1970s, '80s and '90s wrote about this problem. One can follow the tags for my notes on this problem. The worst expression of this would be the denial of personal responsibility for sin because of circumstances. But, a nuance on the false religion of psychology seems to come up in conversations more with the Gen-Xers than with the Boomers. This false idea involves the great misunderstanding of God's Mercy. For most people who want to discuss sin and mercy, the idea of mercy seems to be that God excuses one from sin because of a set of circumstances, emotional problems, history, or even genetics. The CCC helps us realize, first of all, how sin is actually defined. What we have now in America and in many Western countries are structures of sin, "legal moralism" as I wrote days ago. Sin is in the will, not in the emotions, which psychology falsely teaches. Sin may be of a less or more culpability, but never completely without culpability. There are too many so-called healing ministries which attempt to "heal" sin, when in reality, one must decide not to sin. Can trauma or abuse, for example, lead to sin? Yes, but even if one's will is weak, one can choose not to sin. God always gives one enough grace not to sin. Psychological problems do not justify us, Faith does. And, God's Mercy does not make excuses for our sins so that we "get off the hook". God's Mercy shows us the depth of our sins, shows us the Justice which would demand reparation, or even hell, and then, forgives us, not because we are worthy, or emotionally damaged, or ill, or poor, or abandoned, but because Christ died for each one of us. Mercy comes flowing out of the Blood of the Lamb of God on the Cross, not from psychological explanations of sin. Sin is in the will-whether one has a formed conscience, or an ill-formed concscience, sin comes from a decision. Of course, it can be much more difficult for those who have been wounded in any way to become saints. But, this woundedness makes for great saints, not for little ones. God allows the woundedness in order for His Own Glory to shine forth. Mercy is not based on excuses, but on God's tremendous love of the sinner. Only those who face their own sins, daily, will become saints. Such is the way of perfection... To face one's woundedness is part of carrying the Cross. To not sin while carrying this cross is sheer grace, and the need for God's Providence, Mercy, and Justice. I read several Jewish newspapers or websites and recently have noticed that even some of the more orthodox authors have referred to the End Times. A feeling that their Messiah is coming soon seems to be growing in some quarters. This "feeling" or sense has to do with reading the signs of the times. Of course, Catholics know that Jesus Christ is the Messiah, the Promised One. Some Catholics also believe that time is short for the Second Coming. I do not believe the time is short, but that the tribulation will last longer than most people think. I have always believed that it is the Millennials which will see the great age of the martyrs, and have shared this since that group has been in high school. But, to know that our brothers and sisters of the Old Testament may be sensing something makes me reflect that at the end, the Jewish People will look on Christ and convert. The more orthodox Jews believe in the personal Messiah, but many of the liberal ones only believe in a Messianic Age of progress and peace. That is a dangerous idea, of course, as only the AntiChrist will bring peace without Christ. There is no real age of unity or peace unless that peace comes from coherence to the Gospel, to Christ Himself. Pray for our brothers and sisters of the past Old Covenant. Perhaps some of them are being led to get ready for the Second Coming, although they believe it will be a first coming. I use to have an Image Book copy of this delightful set of stories about St. Francis. If you need an idea for a present for a child from age 10 or so, I recommend this. Little Flowers of St. Francis. Children in their innocence seem to be drawn to St. Francis. The entire book is, also, on line and may be found here, among other places. Most children love the story of the taming of the wolf of Gubbio, which is in the book. St Francis being once grievously ill, Brother Leo, as he was in prayer by his bedside, was rapt in ecstasy, and carried in spirit to a great, wide and rapid river; and watching those who crossed it, he saw some brothers enter the river heavily laden, who were carried away by the current and were drowned; some contrived to reach one third of the way; others arrived as far as the middle of the stream; yet none could resist the rapidity of the waters, but fell down and were drowned. Presently he saw other brothers arrive; these carried nothing on their backs, but all bore upon the marks of holy poverty. They entered the river, and passed over to the other side without any danger to themselves. Having seen this, Brother Leo came to himself; and St Francis knowing in spirit that he had had a vision, called him to him, and asked what he had seen. When Brother Leo had related to him the vision, St Francis said: "What thou hast seen is indeed true. The great river is the world; the brothers who were drowned are those who do not follow their evangelical profession, or practice the great virtue of poverty; but they who passed the river are those who neither seek nor possess in this world any earthly riches, who having food and raiment are therewith content, and follow Christ naked on the cross, bearing joyfully and willingly his sweet and easy yoke and loving holy obedience: these pass easily from this earthly life to life eternal." 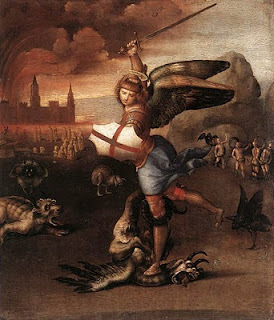 Returning to the idea of discernment as understood by St. Ignatius, an idea which I covered in some posts earlier this year and last month, I want to emphasize a few points which may help some readers avoid the deadly fall into deceit when the times of tribulation come upon us. One falls into deceit when one does not know one's self, and when one does not have a relationship with God. For St. Ignatius, one's relationship with God was a constant, something which "happened" all day, in every circumstance. If one is talking with a friend, God is there in the conversation, When one is shopping, God is there with one, and when one is walking in the sunshine, God walks with one. There is never, for the Catholic who is in sanctifying grace, a time when God is not in relationship. For those who have been in love, we understand this permeation of love in all things, at all times. God is conscious of us all the time. If He was not, we would not exist. In prayer, we attempt to become conscious of God, Who is with us all the time. But, too many Catholics want to put God in a box. They do not want God to be in their living rooms, sitting by them at the computer, in the midst of a conversation. The God-in-a-box is a safe God, a God controlled by one's own will. Sometimes people remember their "conversion" or "reversion" experience as if that was the only time God was with them in some way. It is good to remember important encounters with God, such as our First Communion Day, or the day one got married, or made a vow to a religious order and so on. But, those peak moments do not define one's relationship with God. God in one's life is not now and then, but always, all the time, everywhere. God may be most obvious in suffering. Lately, I have encountered much I suffering and have tried to find God in that suffering. Of course, I do find God in the suffering--the God of the Passion. Every Friday, as part of my prayers for the Auxilium Christianorum, I pray the Litany of Humility. Now, when one prays this, one must expect God to answer this litany. God takes us seriously when we pray. Let me remind you of this litany. And, let me give you real examples of how God answers this, the God Who encounters us in ordinary as well as extraordinary events of our days. From the fear of being ridiculed ..."If you are the Son of God, come down from the Cross." From the fear of being suspected ..."Is not this the carpenter's Son?" 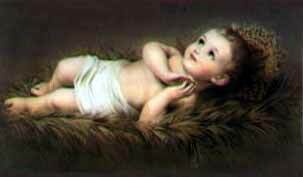 When one is able to fulfill the graces of this litany, a person would be completely free. God would not longer be in a box, but one would walk and talk and sleep in God constantly. If a Catholic does not want to become truly humble, he or she should not say this prayer. God answers this prayer and He is no longer in the box of one's own making. Sometimes, God will take a person to the edge of Gethsemane and make one wait until one is strong enough spiritually to enter into the Garden. One can see the darkness, but not understand, until He allows one into the place of His Own suffering. Then, and only then, does the Catholic become authentic. Until one really accepts suffering with Christ in His Passion, all is pretense and play. Three times Christ asked Peter is he loved Him, because of the three denials of Peter. Not only was Christ showing Peter how to forgive, but the necessity of being open to the daily encounter with God. It is too easy to betray God. It is too easy to put Him into a box. Like St. Ignatius, one has to come to the knowledge that God is with us, all around us, in every circumstance, constantly. In this realization, we come to knowledge of the self, and knowledge of God. The more one knows one's self and knows God, the greater is one's capacity to love. We meet Christ at Mass Who has allowed us to put Him in a box, the tabernacle. Christ Present in the Host has become the Vulnerable God, the Hidden God in the Host. One thinks that one can manipulate this Small God. Those who have put God in a box cannot appreciate either spiritually or spiritually the great freedom which Christ has given us in the Eucharist. We consume God. We become one with Him as He becomes one with us. We become the box, the tabernacle of God. We hold Him either in love and awe, or even in a darkness. For those who receive Him unworthily, (and only God can make us worthy), the Body of Christ is again, as during the Passion, put into the cell of satan, the prison of one's own making. The sacrilege of receiving Christ when in serious sin is a mocking of the Passion of Christ, and a denial of His suffering. Either one allows God to purify the body, soul, imagination, memory and will, in order to become a holy receptacle, or one mocks God by imprisoning Him in one's own self-centeredness and sin. 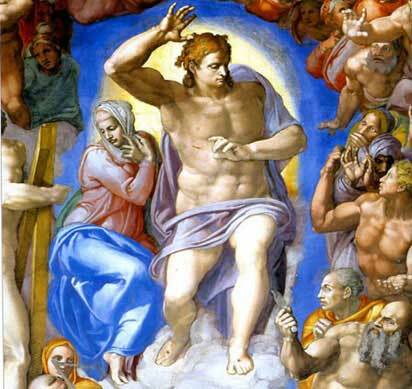 One loses the chance to become more like Christ, and in the narcissism of sin, one wants to make Christ into one's own image and likeness. Only humilty and love can save one from this putting God into a box. Once one understands and experiences love, the box of one's own self becomes a little place of heaven, the cell of contentment and peace. Be a tabernacle, not a prison. Let God out of the box of selfishness, malice, mistrust, fear...let Him meet you in freedom. He is always with us, always, desiring us to meet Him in freedom, humility and love. All barriers, all boundaries melt away, and one becomes alive trusting in God. Life becomes exciting and new, and one learns to live outside the box of conformity, false comfort, and selfishness. Let God out of the box of your own making. Let Him lead you into freedom. 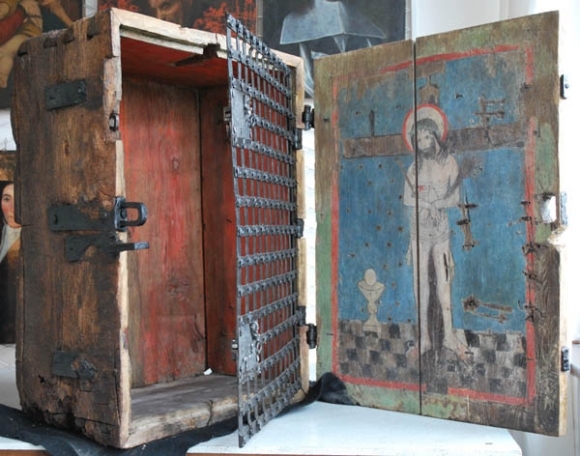 BTW, during the Protestant Revolt in England, the Protestants made fun of the True Presence, by referring to the Eucharist as the Jack-in-the-Box, a reference to an earlier myth that a local saint in Princes Risborough captured the devil and put him into a boot. This horrible disrespect and blasphemy of the Protestants towards the Eucharist displayed itself in the mockery of the Consecrated Hosts in many places, including the documented throwing of the Hosts on the ground at Fountains Abbey and the visitators forcing the horses to trample Christ. The tabernacles of England were emptied for a long time because people wanted to put God into a box of their own making. This is the END series in my perfection quest on this blog. In the next few days, this coming week, I shall write a series showing the goodness of natural law, and the false revisionists of natural law. There are two new schools can be called the "Oderberg and Feser Group" which is the reformulation of old natural law, vs. "Grisez, Rhonheimer and Finnis Group" the Neo-Natural Law people who separate the act from the wholeness of the end of each action. The second group claim to be conservative, but they have fallen away from the end being God, believe it or not, in each moral act. The first group has it right. The second group denies real Christology, and Grisez does not understand God fulfilling all desire, all, including the desires of the moral heart. I do not think he understands Love, as all the mystics do. They all claim to be Thomists, but when one separates metaphysics from morality, confusion between ends and rules, actions and goals happens. One's actions draws one to towards an ultimate end. Also, remember, that virtues are not an end in themselves. What has happened to the understanding of the metaphysics? Where is the traditional ontology, Christology....The second group act like Kantians. But, something is missing.....The second group falls into "virtue ethics", (remember, from the Protestants, a false ideal in the 1970s), instead of traditional understandings on natural law. Thomas Aquinas calls the reality the exercise of the virtues-the beatitudes. And we do this in conformity with natural law. What is missing is the MOVEMENT TOWARD PERFECTION with God being involved with one's self, and by each one of us giving our selves to God. What is missing is the longing and understanding of LOVE. Natural law in the second school falls into consequentialism, utilitarianism, relativism, and subjectivism. In order to follow this mini-series, the last on THIS blog, read the encyclical below. 7. However, this Agnosticism is only the negative part of the system of the Modernists: the positive part consists in what they call vital immanence. Thus they advance from one to the other. Religion, whether natural or supernatural, must, like every other fact, admit of some explanation. But when natural theology has been destroyed, and the road to revelation closed by the rejection of the arguments of credibility, and all external revelation absolutely denied, it is clear that this explanation will be sought in vain outside of man himself. It must, therefore, be looked for in man; and since religion is a form of life, the explanation must certainly be found in the life of man. In this way is formulated the principle of religious immanence. Moreover, the first actuation, so to speak, of every vital phenomenon -- and religion, as noted above, belongs to this category -- is due to a certain need or impulsion; but speaking more particularly of life, it has its origin in a movement of the heart, which movement is called a sense. Therefore, as God is the object of religion, we must conclude that faith, which is the basis and foundation of all religion, must consist in a certain interior sense, originating in a need of the divine. This need of the divine, which is experienced only in special and favorable circumstances, cannot of itself appertain to the domain of consciousness, but is first latent beneath consciousness, or, to borrow a term from modern philosophy, in the subconsciousness, where also its root lies hidden and undetected. 36. But while they endeavor by this line of reasoning to prove and plead for the Catholic religion, these new apologists are more than willing to grant and to recognize that there are in it many things which are repulsive. Nay, they admit openly, and with ill-concealed satisfaction, that they have found that even its dogma is not exempt from errors and contradictions. They add also that this is not only excusable but -- curiously enough -- that it is even right and proper. In the Sacred Books there are many passages referring to science or history where, according to them, manifest errors are to he found. But, they say, the subject of these books is not science or history, but only religion and morals. In them history and science serve only as a species of covering to enable the religious and moral experiences wrapped Up in them to penetrate more readily among the masses. The masses understood science and history as they are expressed in these books, and it is clear that the expression of science and history in a more perfect form would have proved not so much a help as a hindrance. Moreover, they add, the Sacred Books, being essentially religious, are necessarily quick with life. Now life has its own truths and its own logic -- quite different from rational truth aand rational logic, belonging as they do to a different order, viz., truth of adaptation and of proportion both with what they call the medium in which it lives and with the end for which it lives. Finally, the Modernists, losing all sense of control, go so far as to proclaim as true and legitimate whatever is explained by life. 51. To add some more general directions, Venerable Brethren, in a matter of such moment, We order that you do everything in your power to drive out of your dioceses, even by solemn interdict, any pernicious books that may be in circulation there. The Holy See neglects no means to remove writings of this kind, but their number has now grown to such an extent that it is hardly possible to subject them all to censure. Hence it happens sometimes that the remedy arrives too late, for the disease has taken root during the delay. We will, therefore, that the Bishops putting aside all fear and the prudence of the flesh, despising the clamor of evil men, shall, gently, by all means, but firmly, do each his own part in this work, remembering the injunctions of Leo XIII in the Apostolic Constitution Officiorum: "Let the Ordinaries, acting in this also as Delegates of the Apostolic See, exert themselves to proscribe and to put out of reach of the faithful injurious books or other writings printed or circulated in their dioceses. "29In this passage the Bishops, it is true, receive an authorization, but they have also a charge laid upon them. Let no Bishop think that he fulfills his duty by denouncing to Us one or two books, while a great many others of the same kind are being published and circulated. Nor are you to be deterred by the fact that a book has obtained elsewhere the permission which is commonly called the Imprimatur, both because this may be merely simulated, and because it may have been granted through carelessness or too much indulgence or excessive trust placed in the author, which last has perhaps sometimes happened in the religious orders. Besides, just as the same food does not agree with everyone, it may happen that a book, harmless in one place, may, on account of the different circumstances, be hurtful in another. Should a Bishop, therefore, after having taken the advice of prudent persons, deem it right to condemn any of such books in his diocese, We give him ample faculty for the purpose and We lay upon him the obligation of doing so. Let all this be done in a fitting manner, and in certain cases it will suffice to restrict the prohibition to the clergy; but in all cases it will be obligatory on Catholic booksellers not to put on sale books condemned by the Bishop. And while We are treating of this subject, We wish the Bishops to see to it that booksellers do not, through desire for gain, engage in evil trade. It is certain that in the catalogs of some of them the books of the Modernists are not infrequently announced with no small praise. If they refuse obedience, let the Bishops, after due admonition, have no hesitation in depriving them of the title of Catholic booksellers. This applies, and with still more reason, to those who have the title of Episcopal booksellers. If they have that of Pontifical booksellers, let them be denounced to the Apostolic See. Finally, We remind all of Article XXVI of the above-mentioned Constitution Officiorum: "All those who have obtained an apostolic faculty to read and keep forbidden books, are not thereby authorized to read and keep books and periodicals forbidden by the local Ordinaries unless the apostolic faculty expressly concedes permission to read and keep books condemned by anyone whomsoever."